In the bright glow of moonlight and the quiet peace of the Forest you can feel the magic of Marky the Wizard. Whenever they are in trouble, the Children of the Forest go to Marky for help because he is very wise. In fact, Marky is a most splendid Wizard. He is able to change into all kinds of wonderful things! Once, a long time ago, Herman the Troll had climbed a tree to study how the wasps made their mud nests. Looking down he discovered that he was afraid of heights. Marky turned into a long ladder and Herman was able to climb safely down. Another time, Misty the Elf Princess was looking for a lost fox cub tamed Topsy. Marky changed into a large wide-eyed owl and with Misty on his back flew over the treetops until they found him. Topsy was hungry and shivering with cold, huddled on top of a large rock in the middle of the Stream of Fantasy. He'd gotten there by playing leap frog on the rocks in the stream bed, but when he'd turned to go back, found the shore far away. Topsy had been too frightened to move, so he'd waited for help to arrive. Marky landed beside him, and when Misty had tied a rope around him so he wouldn't fall off, flew them all safely to shore. His mama was so glad to see him, but after all the hugging and kissing were done, she gave Topsy a good spanking for scaring everyone. Topsy promised never to wander away again! 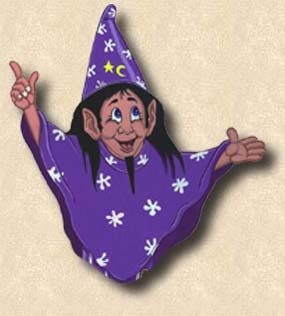 Dressed in purple, with large blue eyes, and wearing a pointed hat on his head, Marky the Wizard is a friend to all.